Folk Dance Scene is the official publication of the Folk Dance Federation of California, South, Inc. and is published to educate its readers concerning the folk dance, music, costumes, customs, lore, and culture of the peoples of the world. It is also designed to inform them of the opportunities to experience folk dance and culture in Southern California and elsewhere. 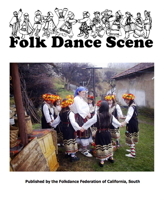 Folk Dance Scene is published monthly, except for combined issues in June/July and December/January. Folk Dance Federation of California, South, Inc., an organization.